Each image is printed in a professional lab using a ZBE Chromira RBG-light printer and Fuji Crystal Archival paper. These are true photographic prints using superior darkroom chemicals - not ink. Each image is calibrated to maximize the most vibrant and true color for printing output. It is of high priority that the color output of each print is what you see on your computer screen. Note: Computer monitors, color profiles and photo printing chemistry can vary. Prints are processed upon purchase and each signed by the artist. Each print is mounted on sturdy MDF board using an acid-free mounting tissue to prevent the image from yellowing over time. The print is "fused" (using a specialized heating process) onto the wood and then covered with UV filtering film that protects it from fingerprints, dirt, moisture, and other environmental contaminants. This process produces a beautiful, non-glare matte finish - similar in appearance to a Glicee painting on canvas. Finished mounted prints are available in 4 standard sizes*, 2 mat options and 3 mount styles. *Prints will measure standard sizes except in a few rare instances where they may vary slightly depending on: (1) the original format (slide, film or digital) and/or (2) crop used for best display. Please Contact if you would like print sizes other than what is listed. For those who prefer a more traditional look, there are two mat options available. For a virtual view and audio description comparing the two options, click on the links. 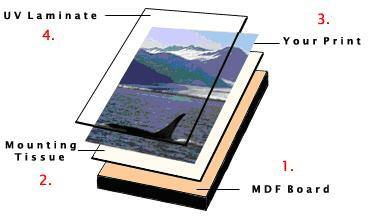 Your image selection is digitally enhanced with a black mat border, printed and then laminated on a 1/4" board. It can be mounted as a LITE, FLOAT or BOX - your choice. Your image selection is laminated on a 3/8" board with beveled edge. 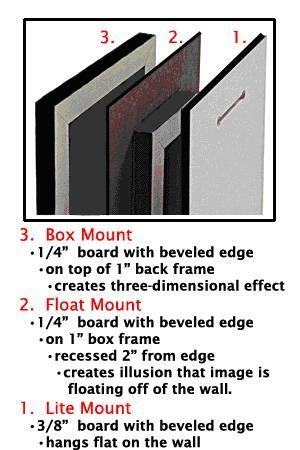 The image board is mounted on a black backboard that extends 1"-3" beyond and beneath the image border - appearing three-dimensional because it highlights (or lifts) the image off of the mat. It can be mounted as a LITE, FLOAT or BOX - your choice. There are three mount styles available-a LITE, FLOAT or BOX. The graphic below shows a back view and gives a brief description of each. For a virtual view and audio description comparing profiles of the three mount styles, click the video link above. For a virtual view and audio description of each mount type described below, click on the links to view a short movie. The photograph is laminated on a 3/8" board with beveled edge finished in black. The finished image board hangs flat against the wall. The photograph is laminated on a 1/4" board with beveled edge finished in black. The image board is placed on a custom 1" box frame that is recessed 2" from the outer edge of the image - giving the viewer the illusion that the image is floating off the wall. This is my favorite mount. The photograph is laminated on a 1/4" board with a beveled edge finished in black. The image board is merged on top of a 1" deep custom box frame. It hangs flush extending 1" off the wall - giving it a framed and 3-dimensional appearance. The edges of the wood mount are beveled and finished in black to create a modern and stylized piece. All mounted pieces arrive ready to hang using a French cleat style hanger - hanging instructions and screws are included. The UV laminate coating protects your print from finger smudges and the elements. With this laminate finish, you do not have to worry about damaging the finish-simply use a soft cloth (dry or moist) to wipe away dust and dirt.